Segregation – Solids Handling Technologies, Inc.
1. How can bulk solids flood or flush out of a bin? Answer: Fine solids flowing in funnel flow (some material moving most material stagnant) typically experience flooding problems. In funnel flow, a preferential flow channel forms, usually directly over the outlet. If fresh material is placed in the container, it will flow into the preferential flow channel and not have enough time to deaerate. The bulk solid now behaves as a fluid. As it reaches the outlet, the feeder which is designed to meter a solid cannot contr ol a fluid, and the aerated product will flow uncontrolled from the vessel. Additionally, if a “rathole” forms, where the preferential flow channel empties and forms a stable pipe, fresh product brought into the vessel or material that sloughs off the top of the pile will fluidize and flush from the bin. 2. What are the requirements for a properly designed mass flow bin? The hopper slope required to ensure flow along the walls. The definition of mass flow is that when material is removed from a bin, all the material is in motion. In order for all the material to remain in motion, it must flow at the walls of the bin. There is friction that develops between the bulk solid and the wall surface of the hopper. If the walls are too rough or too shallow, the material will flow on itself rather than on the rougher/shallow walls. In mass flow, the walls are typically steep and smooth to ensure flow along them. Interestingly, if the material is cohesive, it may arch (bridge) over the opening causing a flow stoppage, even in mass flow. 3. Am I restricted to steep conical hoppers to ensure mass flow? Answer: Not necessarily. Wedge shaped hoppers are a great alternative to conical hoppers. Wedges, such as chisel or transition type are more forgiving from a flow standpoint. Keep in mind that material in a conical hopper has to converge in 360°. While in a wedge configuration converges in only on e direction. Wedges use slotted openings which require smaller widths to prevent arching and shallower hopper slopes to ensure mass flow. Because of the long slot, wedges will also provide a higher discharge rate. One very important consideration is that the feeder design is as important as the wedge hopper. 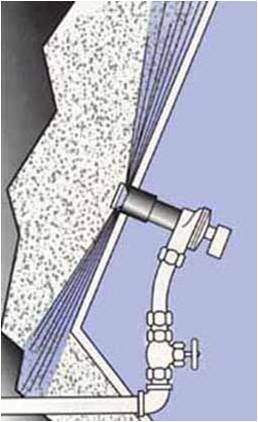 If the feeder (likely a screw or belt) is not designed to discharge material over the entire cross sectional area of the slot opening, the mass flow pattern will be destroyed. 4. My material’s angle of repose is 46.3°. How do I use this data to design a bin? Answer: You cannot design a bin just from the angle of repose. What opening size do you use? What is the hopper slope, 46.3°? You have to measure a materials flow properties in order to properly design a bin or hopper. The angle of repose can be used to determine the contour of a pile of material, perhaps to determine volume in a bin or silo, but not to design a bin. 5. I have been told that my material segregates, how does this happen? 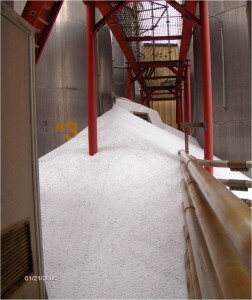 Answer: Segregation can occur via sifting, fluidization, etc. Segregation requires: easy flowing material, interparticle motion and a range of particle sizes. 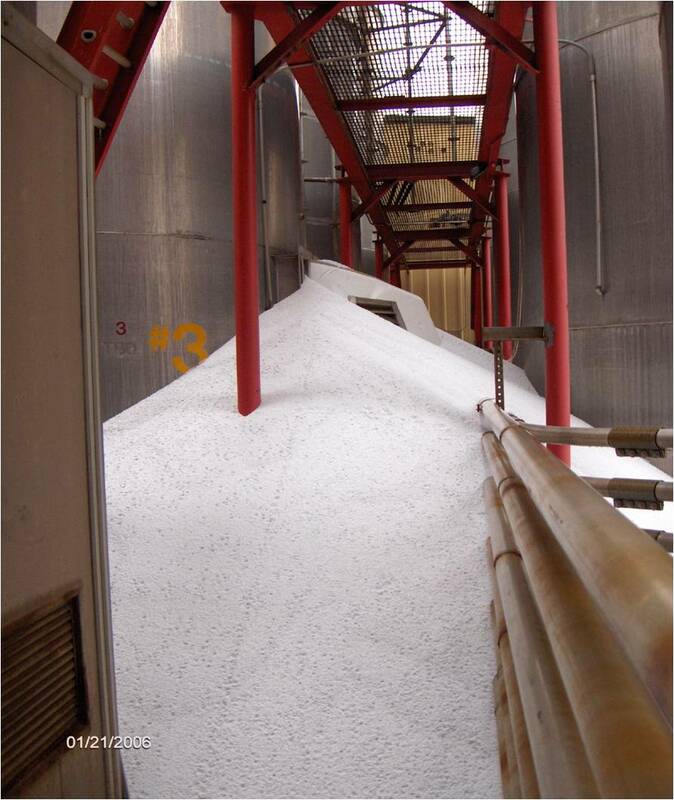 Sifting occurs when filling a bin or forming a pile, the fine particles sift through the coarse particles, allowing the fines to concentrate in the center while the coarse particles roll or slide to the outside. This is considered side-to-side segregation and is typically resolved by ensuring mass flow. 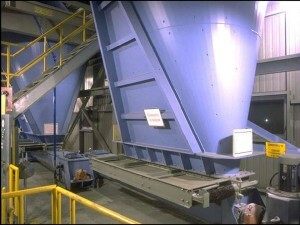 Fluidization segregation occurs when solids are dropped into a bin from a conveyor such as a pneumatic conveyor. The coarse particles are driven to the bottom while the fine particles remain airborne and settle on top. This is considered top to bottom segregation and in this case mass flow simply exacerbates the problem. 6. What happens if my material is extremely difficult flowing? Answer: Unassisted gravity flow is typical the best way to handle powders; however, when your material is difficult flowing and gravity needs help, a flow aid device may be used. There are many types of flow aid devices available to choose from such as vibratory, agitation, forced extraction, aeration, flow aid chemicals, and even explosives. You should typically have your material’s flow properties measured to ensure that gravity is not achievable but the tests will also help you to choose a flow aid device, if required. For instance, if your material is sensitive to excess pressures (caused by high drop heights into the bin or excess vibrations), do not use vibratory flow aids to solve your problem. I will be presenting a workshop entitled: “Propensity for Particle Caking and Solutions Involving Flow Aids” at Powder & Bulk Solids’ Texas conference and exhibition on October 15, 2013 (Conference and exhibition is offered on October 14-16, 2013 at the Reliant Center, Houston, TX). Joseph Marinelli is a consulting engineer and President of Solids Handling Technologies. He has been providing testing and consulting services since 1972. As a former consultant with Jenike & Johanson, Inc., he has years of experience testing powders and designing bins and feeders for reliable flow. He lectures frequently on the topic of powder handling and has published several papers including and article in a chemical encyclopedia and two in a food powder book.